Step 2: Download and fill out the GMO Testing Analysis Form and then email or fax to 480-275-3214. Step 3: Sign Agreement & Payment Form. This will be sent after the GMO Testing Analysis Form is reviewed for pricing. 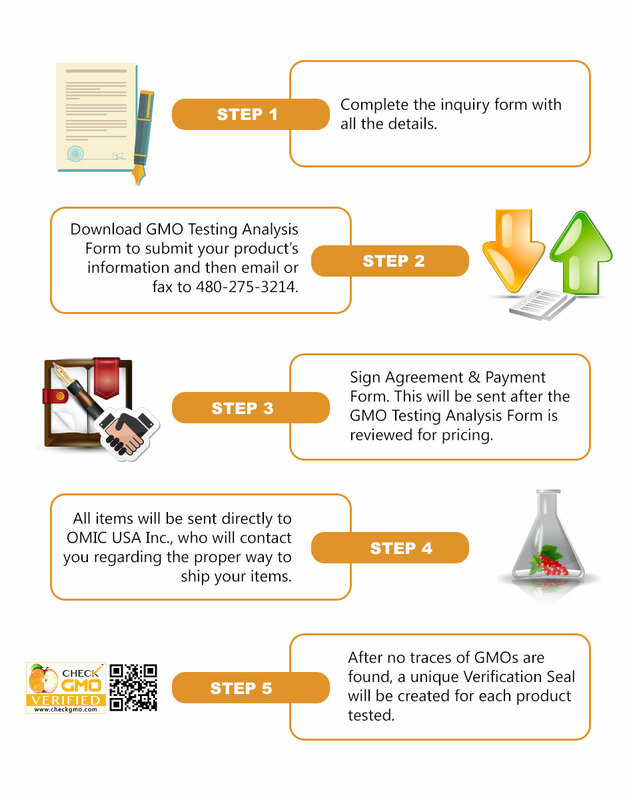 Step 4: Check GMO LLC works directly with OMIC USA, Inc. for all GMO Lab Testing. All items will be sent directly to the address below after step 3 is complete. OMIC USA, Inc. will contact you regarding the proper way to ship your items. Step 5: Verification Seal. After the product passes specific lab tests with no traces of Genetically Modified Organisms, unique Verification Seals will be created for each Product. Each Seal contains a QR code that will direct the consumer to a page with the dated test results. Where can the Verification Seal be used? The seal may be used only to represent the product tested, which may consist of the packaging, website, advertisements, etc. Companies who have received the Verification Seal for use will maintain guidelines of production and agree to re-test any items that have changed suppliers. Re-testing may be submitted at any time if companies desire to create an updated test result page. Inspection requests may also be submitted directly through the Lab. Schedule an Inspection. Who does the GMO Lab Testing? Check GMO LLC has selected OMIC USA Inc., — the North American leader in pesticides, genetically modified organisms, microbiology and nutrition — to handle our GMO testing. OMIC USA Inc. is an ISO 17025:2005-CERTIFIED analytical laboratory with additional certifications and memberships with such organizations as the Korean Food and Drug Administration,, ORELAP (Oregon Environmental Laboratory Accreditation Program), ACLASS, AOAC (Association of Official Analytical Chemists International), AACC (American Association of Cereal Chemists) International, GAFTA (The Grain & Feed Trade Association), IFT (Institute of Food Technologists) and ACS (American Chemical Society). Is there an expedited process? Rush orders are completed in 3 days. Add 50% of the original cost. When do I get the Verification Seal? Unique seals and pages will be sent within 5 business days after the product passes specific lab tests with no traces of Genetically Modified Organisms. Testing starts as low as $100 per trait. Higher risk items that contain corn, canola, or soy would be more costly to test. Do we test based on ingredients? Yes, we do. This provides a cost effective option that allows companies to save money when testing other products carrying the same ingredients. Why test USDA Organic certified items for GMOs? Although GMO cross-contamination and mechanical admixture occurrences are on the rise, there is no testing required to show whether cross-contamination or pollination has taken place. Check GMO tests at levels as low as < 0.1% to avoid such concerns. What does the “Check GMO Verified” seal mean? The “Check GMO Verified” seal means that the product has been tested and verified to contain no traces of GMOs. Check GMO understands consumer awareness of and demand for GMO labeling. Our Verification Seal provides consumers confidence in the fact that the product in question has been lab tested by an ISO 17025 accredited laboratory. The additional step of adding a unique QR code to each product gives the consumer testing-related details, such as when the product was tested. All ingredients in a product must be tested before a “Check GMO Verified” seal can be issued. We use a threshold of 0.1% for testing. This is 0.8% lower than levels required by law and other verification agencies. Any product containing over 0.1% GMO traces will not receive the “Check GMO Verified” seal. Check GMO’s standards are based on OMIC USA Inc.’s Compliance Code. Agreements based on the use of our seal must require companies to re-test any items for which suppliers have changed. If Check GMO is notified of a supplier change by a third party, then an audit may take place requiring the company to re-test the product in question for traces of GMOs. A unique QR code will be assigned to each product in order to provide consumers access to testing details. Annual audits and inspections may be conducted for high-risk products, such as corn, canola, and soy.